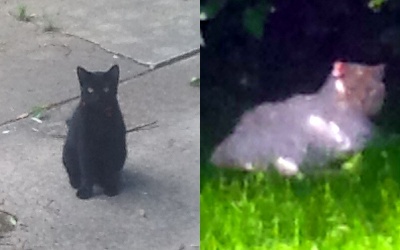 For a little cat blogging variety, some of the neighbor cats have been haunting the backyard. The black cat is wearing a bell, but it clearly has limited effect as I saw him very nearly catch a house finch off one of the bird feeders. He (I’m guessing) was also mewing plaintively at the squirrels in the tree, but I’m pretty sure he would regret catching one. For a humorous take, here’s The Oatmeal on ‘How Much Cats Actually Kill.’ Most wild animal and bird kills are done by feral cats, but even well-fed domesticated cats are murderous little beasts. Even more reason to keep your cat safe and indoors.